The U.S. economy is experiencing its second largest expansion since World War II. At the same time, the U.S. workforce continues to tighten as Boomers enter retirement and working-age populations have peaked. In the next 10 years, the available talent will plateau. These demographic shifts will have a major impact on the workplace and how companies recruit talent. The following White Paper examines these and other trends in a recent HGA survey circulated to multiple industries and geographies. As a follow-up to an earlier survey, What Matters Most in the Workplace (2015), this latest National Workplace Forecast delves deeper into current and emerging trends—such as a growing focus on wellness and well-being—to understand how workforce changes are informing organizational drivers, current practices, and employee work experiences. To frame our findings, we identified three primary trends that influence recruitment and retention. Optimize Human Potential – As organizations continue to evolve, the workplace needs to become a learning environment. Survey respondents identified knowledge transfer and mentorship as having the greatest impact on our future. As the rate of change accelerates, learning will continue to become more contextual to the employee workstream. Fostering the transfer of knowledge is more than imparting wisdom from an older generation to a younger one. The relationship is reciprocal. 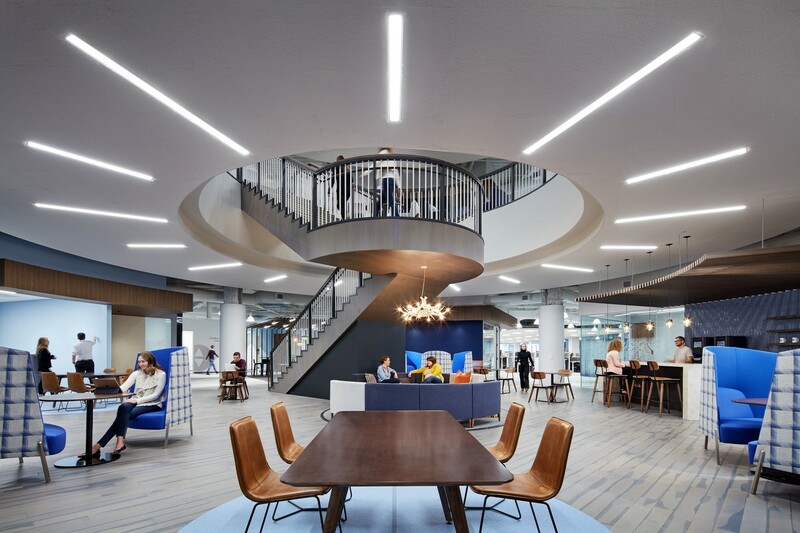 Understanding how space affects utilization, productivity, and learning is critical to optimizing your employees’ potential. Shift from Object to Experience – Thriving requires an integrated, human-centered approach. 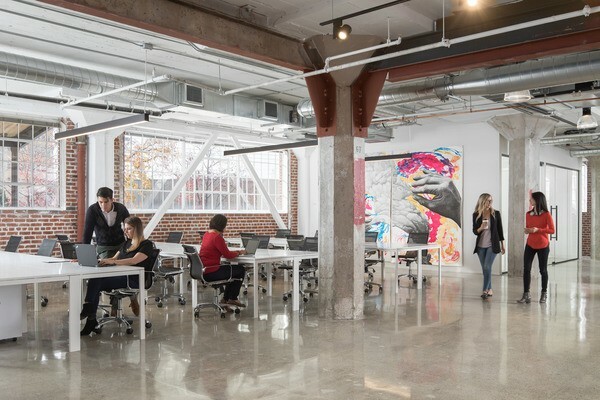 Workplace needs are driving a paradigm shift from creating places to providing experiences. This is seen in priorities of wellbeing, the connection of aesthetics to recruitment and retention, and the desire for more integrated digital/physical experiences. When viewing well-being through a social lens, people are seeking workplaces that connect them to a sense of purpose, the opportunity to feel empowered, and the right to feel safe. Move at the Speed of Change – The third trend is the culmination of the first two trends. Moving at the speed of change requires a foundation for employees to grow professionally. Survey findings mirror what we are seeing in several industries: a re-evaluation of delivery models, a deeper understanding of innovation culture, the value of connection to purpose, and the expanding diversity of people. All are required for any organization to succeed. Organizations that embrace change will flourish in the future. To flourish, organizations must foster continuous learning, a sense of community, and individual and organizational agility. This begins with a mindset that recognizes that workplace evolution is accelerating, and that wellbeing is a shared responsibility. Expanding an understanding of environmental and experiential strategies known to foster creativity and learning. The role of digital integration tools and physical proximity in innovative processes. How emerging and diverse talent will continue to shape the evolution of work. National Workplace Forecast: Talent, Experiences, and Constant Change.